Growing prevalence of obesity continues to impact health of the patients adversely. Prevalence of obesity is bound to various factors such as improper diet, chronic stress and intake of medications for diabetes and depression. Untreated obesity has led to health issues such as diabetes, sleep apnea, high blood pressure, heart disease, cancer, osteoarthritis and psychosocial effects. According to Transparency Market Research, the global anti-obesity prescription drugs market is expected to represent a value of over US$ 1,000 Mn by the end of 2026. According to a recent report by CDC, over one-third of the adults in the U.S. have obesity. Consumption of the food products that are high in cholesterol has been a major contributor to the obese population. Increasing consumption of the unhealthy food products such as potato chips, meat, bacon, chocolates and other sugary treats has led to growing prevalence of obesity globally. Moreover, surge in consumption of alcoholic beverages is further expected to contribute towards obesity. 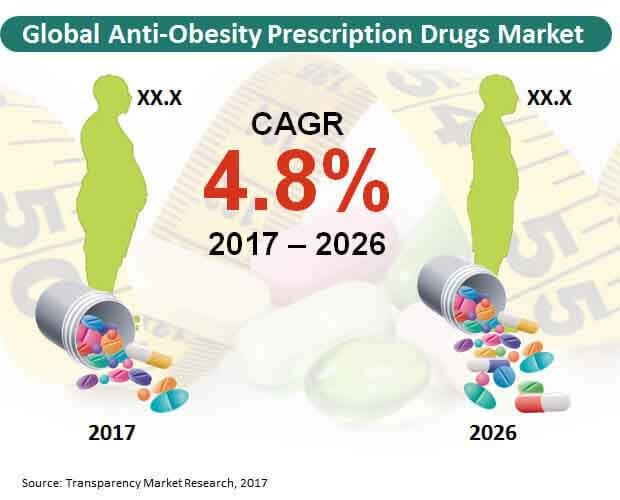 Growing prevalence of obesity due to increasing consumption of cholesterol-rich and unhealthy food products and beverages is likely to impact growth of the global obesity prescription drugs market positively. Increasing level of stress can lead people to consume unhealthy food products that hinder the brain activity and have a counteracting effect on the emotional and physical stress. In addition, surge in the stress level leads to “comfort eating”, due to which the end users are more prone to obesity. Moreover, prolonged stress due to emotional pressure leads the brain to release cortisol hormones, which increases the appetite levels in the person. Eating disorders and consumption of unhealthy food products lead to long-term problems for the blood vessels and heart. Consumption of unhealthy food products and beverages in order to counter stress-related problems further contributes towards obesity. Bound to these factors, the global anti-obesity prescription drugs market is expected to witness positive growth during the forecast period. Obesity has also been a result of consuming drugs for diabetes such as sulfonylureas, insulin and thiazolidinediones. A recent report by CDC states that 9.4% of the population in the U.S. have diabetes. Consumption of drugs for diabetes stimulate appetite, due to which the patients eat more and gain weight. Moreover, obesity is also a common side-effect of consuming antidepressants drugs. As consumption of anti-depressant drugs stimulate hunger, consumers tend to eat more. These factors further contribute towards prevalence of obesity globally. Surge in the obese population is attributed to increasing consumption of the antidepressant and diabetes drugs, which is expected to impact growth of the global anti-obesity prescription drugs market. On the other hand, various factors are expected to inhibit growth of the global anti-obesity prescription drugs market. Obese people are increasingly opting for various exercises that enable them to lose weight. As yoga practices are becoming popular, obese patients are increasingly practicing yoga exercises in order to reduce the weight and treat hypertension. In order to shed body fats, the obese people are increasingly opting for sugar free food products and planning diets that help in reducing weight of the end users. These factors are expected to impact growth of the global anti-obesity prescription drugs market negatively. With the increasing blood sugar levels, doctors are prescribing the liraglutide medicines to the patients in order to reduce the risk of obesity. On the basis of drug class, the liraglutide segment is expected to represent the highest revenue growth, accounting for a value of over US$ 100 Mn by the end of 2026. On the other hand, the bupropion and naltrexone drug class segment is expected to register a robust CAGR during the forecast period. Based on age group, the adult segment is expected to witness the highest growth in terms of revenue, recording a value of over US$ 100 Mn by the end of 2017. Along with the pediatric age group segment, the adult age group segment is expected to register a healthy CAGR through 2026. By distribution channel, the hospital pharmacies segment is expected to represent significant revenue growth, representing a value of over US$ 100 Mn by the end of 2026. Moreover, the hospital pharmacies distribution channel segment is expected to register the highest CAGR during the forecast period. Leading market players operating in the global anti-obesity prescription drugs market include F Hoffmann La Roche Ltd, Orexigen Therapeutics, Inc, Arena Pharmaceuticals, Inc, VIVUS, Inc and Novo Nordisk A/S. The global anti-obesity prescription drugs market is expected to witness a moderate growth attributed to growing prevalence of obesity globally. Moreover, surge in consumption of unhealthy food products that are rich in cholesterol has led to an upsurge in demand anti-obesity prescription drugs. Increasing level of chronic stress also contributes towards obesity. Moreover, consumption of psychotropic and diabetic drugs is expected to impact growth of the global anti-obesity prescription drugs market during the forecast period. The report provides an in-depth insight on some important aspects of the global anti-obesity prescription drugs market and offers insights on the growth patterns, various factors fuelling growth of the global market, competitive landscape and important segments. Growth of the global anti-obesity prescription drugs market will mainly remain bound to various macro-economic and micro-economic factors. The report further reveals that the global anti-obesity prescription drugs market is increasingly driven by growing prevalence of obesity globally. Consumption of the food products that are rich in cholesterol continues to contribute towards obesity. Growing consumption of alcoholic beverages will also lead to increase in obesity during the forecast period. Growing prevalence of depression has led to increasing consumption of the psychotropic drugs. Increasing side-effects of the psychotropic drug has contributed towards obesity. Growing prevalence of obesity due to increasing side-effects of psychotropic drugs has led to an upsurge in demand for obesity management. Moreover, increasing prevalence of diabetes has revved up consumption of medications such as sulfonylureas, insulin and thizolidinediones. These medications have appetite stimulating features, due to which the patients tend to eat more. Eating disorders due to antidepressants and diabetic drugs has continued to contribute towards obesity. Increasing demand for obesity management is expected to impact growth of the global anti-obesity prescription drugs market positively. Obesity has also witnessed to be a result of increasing chronic stress globally. Increasing emotional and physical stress level leads the brain to release cortisol hormones. Release of the cortisol hormones further stimulates a person’s appetite, due to which people tend to eat unhealthy food products. Increasing consumption of unhealthy food products helps people to counter their emotional and physical stress. Growing prevalence of obesity due to increasing level of stress has further led to an upsurge in demand for obesity management. Bound to these factors, the global anti-obesity prescription drugs market is expected to witness significant growth. The global anti-obesity prescription drugs market is mainly segmented into drug class, age group, distribution channel, and region. On the basis drug class, the global market is expected to be segmented as Bupropion and Naltrexone, Orlistat, Lorcaserin, Phentermine and Topiramate and Liraglutide. Based on age group, the global market is segmented as Pediatric and Adult. By distribution channel, the global market is segmented as Hospitals Pharmacies, Retail Pharmacies and E-commerce. Key players in the global anti-obesity prescription drugs market are VIVUS, Inc, Orexigen Therapeutics, Inc, Novo Nordisk A/S, F Hoffmann La Roche Ltd and Arena Pharmaceuticals, Inc.